FOR IMMEDIATE RELEASE: Harmony Murphy Gallery is honored to present Disturbing the Peace: Assemblage, Sculpture, and Painting 1963-2011, a survey exhibition of works by artist Ed Bereal. This marks, astonishingly, the artist’s first solo show in Los Angeles, where his work was most recently seen as part of The Getty’s Pacific Standard Time in 2011. In 1968, along with several friends and some of his students from UC-Riverside, he developed the Bodacious Buggerrilla, a street theater troupe aimed at initiating a first person dialogue regarding issues of race, the war in Vietnam, gender, political, and economic power and police brutality. Almost 50 years later, these themes have waxed in relevancy and the legacy and conversations brought forth by this extremely active collection of voices are again taking stage. After two decades of teaching, writing, and extensive travel, Bereal returned to mark-making. The works presented in this exhibition bridge his long and varied career, representing the central themes that have guided his practice as well as his distinct talent for assemblage, humor, and political commentary. 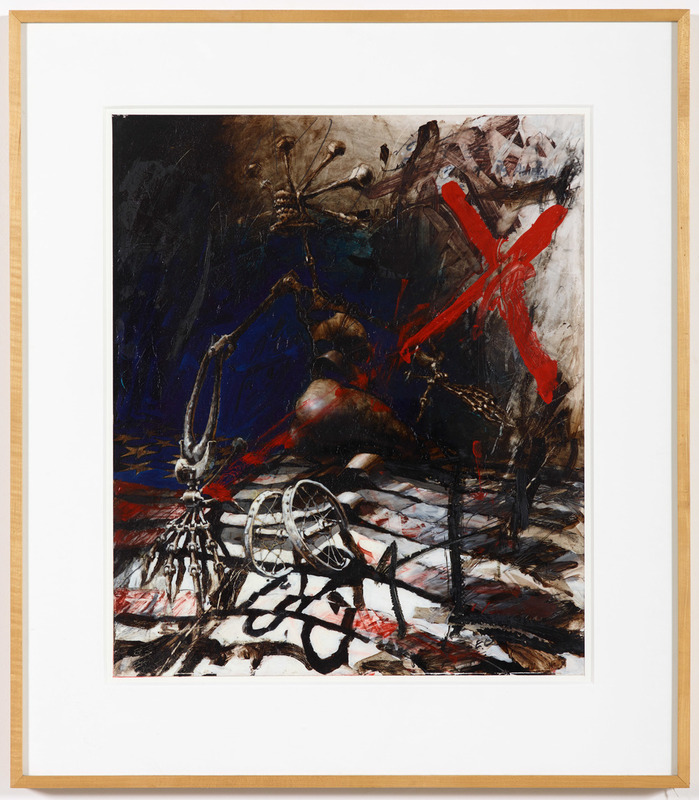 Although the characters and conditions have shifted, evolved, and devolved over the past half century, his work is rooted in the heart-of-the-matter, remaining thought provoking and innovative despite the revising context. The exhibition will include a series of paintings that depict central figures in the Iraq War including George W. Bush and Condoleezza Rice, amongst others, assembled amidst the debris of americana: coke bottles, pieces of the flag, standard oil gas dispensers, etc to portray a pop-esque arrangement of racial cliches, war-time apathy, and undue waste. Bereal’s talent for intricate composition and multi-faceted nuance is evident in the several large-scale sculptures that accompany these works. Utilizing a variety of charged materials such as dolls, toys, plastic guns, comic book characters and various hardwares, each contain a dense narrative carved from a distinct feature of the contemporary condition. 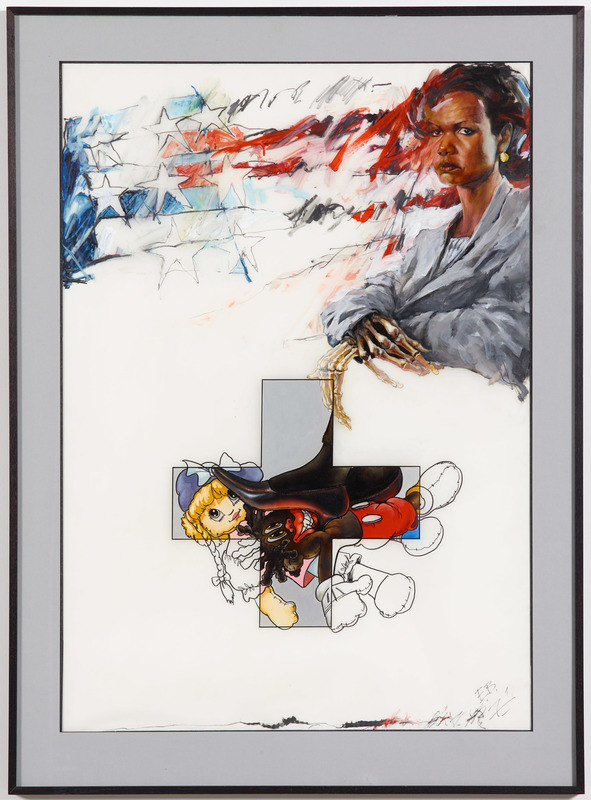 Central to this is his protagonist, Miss America, who has made several appearances in his work throughout the past five decades and is well-represented in this exhibition. As the artist explains: “constructed from the stars and stripes of the flag, (Miss) America personified our national love affair for science and industry, garish materialism and a mechanized militaristic violence which appears seasoned by the all too pervasive, often perverted sexual images that define America, for much of the rest of the world.” The exhibition will also features several videos, including past performances by the Bodacious Buggerrilla and episodes of a quiz show masterminded and hosted by Bereal that ran on public broadcast (PBS) in the late 1980s. Ed Bereal (born 1937) attended Chouinard Art Institute from 1959- 1962 and later taught at University of California, Irvine and Western Washington University. He has been a recipient of several prestigious awards, including those from the Janss Foundation (Los Angeles), the Copley Foundation (New York) and the National Endowment for the Arts (Washington DC). His work is in the collection of many major museums including The Museum of Modern Art, NY; The Smithsonian Institute, Washington D.C.; San Francisco Museum of Modern Art, CA; Museum of Fine Arts Houston, TX; and The Brooklyn Museum, NY. He has been the subject of exhibitions at international venues including Centre Georges Pompidou, Paris (2006) and Moderna Museet, Stockholm (2009); L.A. Object & David Hammons Body Prints, Tilton Gallery, New York, NY (2006); as well as participating in Pacific Standard Time at The Getty Museum, Los Angeles (2011).